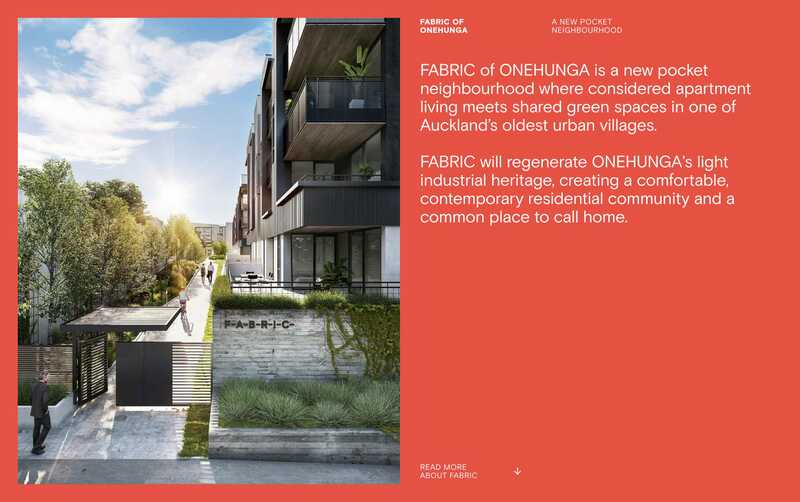 Unique centrally-divided One Pager promoting a new residential area in Omehunga (Auckland, NZ) called Fabric. I’m not sure it’s totally necessary but note the slight parallax effect between sides as you scroll down. The additional "Updates" section is basically their blog, so allowed within the One Page website rules. Lastly, if you’re impressed by the Identity work by Richards Partners make sure you watch the video for more context over on their site. Developers Lamont and Co alongside Colliers International approached Richards Partners to devise a precinct brand for a new residential development in one of Auckland's oldest suburbs. Comprising 5 buildings over a large brownfields site FABRIC needed a compelling story to tell over an extended period while adding to the overall cultural fabric of Onehunga. As a project sitting within a brownfields site of warehouses and light industrial businesses the brand identity reflects the architecture and surrounding context. FABRIC takes its name from the historical use of the site as a clothing factory, while the design system is underpinned by bespoke typography connected by hyphens to resemble threads. Letterforms were then built from the logomark to create a unique display typeface.